As we mentioned back on Monday, NVIDIA was going to be making some kind of GeForce announcement this evening at the NVIDA Gaming Festival 2012 in Shanghai, China. NVIDIA’s CEO Jen-Hsun Huang has just finished his speech, announcing NVIDIA’s next ultra-premium video card, the GeForce GTX 690. 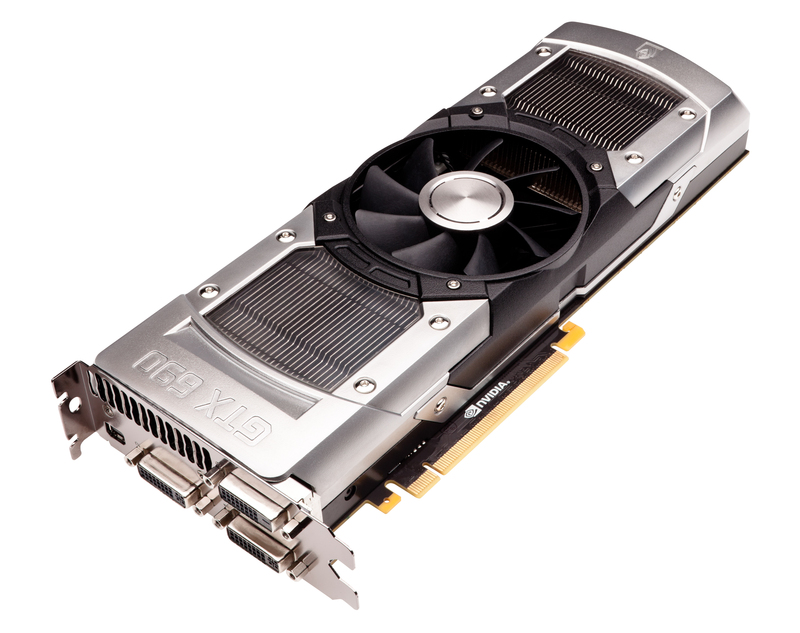 Launching later this week, the GeForce GTX 690 will be NVIDIA’s new dual-GPU flagship video card, complementing their existing single-GPU GeForce GTX 680. Equipped with a pair of fully enabled GK104 GPUs, NVIDIA is shooting for GTX 680 SLI performance on a single card, and with GTX 690 they just might get there. We won’t be publishing our review until Thursday, but in the meantime let’s take a look at what we know so far about the GTX 690. First and foremost, the GTX 690 won’t be launching until this Thursday (May 3rd), and while we won’t be able to publish our review until then NVIDIA has provided a bounty of information on the GTX 690 ahead of the formal launch. Specs wise – and something they’re trying to make clear from the start – unlike what they did with the GTX 590 NVIDIA is targeting close to full GTX 680 SLI performance here. As GK104 is a much smaller and less power hungry GPU from the get-go, NVIDIA doesn’t have to do nearly as much binning in order to get suitable chips to keep their power consumption in check. With GTX 690 NVIDIA will be able to reach their target TDP of 300W with all functional units enabled and with clockspeeds above 900MHz, which means performance should indeed be much closer to the GTX 680 in SLI than the GTX 590 was to its SLI counterparts. Altogether, for the GTX 690 we’re looking at a pair of fully enabled GK104 GPUs (1536 CUDA cores) clocked at 915MHz, paired with 4GB of 6GHz GDDR5 (2GB per GPU) all on a single card. The GPU boost target will be 1019MHz, though until we have a chance to review the card it’s hard to say what the average clockspeeds will be in most games. Taken altogether, this means the GTX 690 should be able to reach at least 91% of the GTX 680 SLI’s performance and probably closer to 95% depending on where GPU boost tops out. As for power consumption, NVIDIA is designing the GTX 690 around a 300W TDP, with a typical board power (and default power target) of 263W. Compared to the 375W TDP GTX 590 this will allow the card to be used in more power/cooling limited computers, something NVIDIA lost going from the GTX 295 to the GTX 590. The tradeoff of course being that clockspeeds had to be lowered compared to GTX 680 to pull this off, which is why even with a more liberal GPU boost both the base and boost clocks are slightly below the GTX 680. As always NVIDIA is going to be doing some binning here to snag the best GK104 GPUs for the GTX 690, which is the other factor in bringing down power consumption versus the 2x195W GTX 680 SLI. With that said, similar to what AMD did with their dual-GPU Radeon HD 5970 and 6990 NVIDIA is in practice targeting two power/performance levels with the GTX 690: a standard performance level and a higher performance level for overclockers. On the hardware side of things the card itself is equipped with 2 8-pin PCIe power sockets, enabling the card to safely draw up to 375W, 75W over its standard 300W TDP. Delivering that power will be 10 power phases (5 per GPU), so the GTX 690 will have power delivery capabilities nearly identical to the GTX 680. Meanwhile on the software side the GTX 690 will have an adjustable power target and clock offsets just like the GTX 680. NVIDIA is giving the GTX 690 a max power target of +35%, which given the card’s default power target of 263W means it can be set to draw up to 355W. Until we have a chance to review the card it’s not clear just how many bins higher than the boost clock GPU boost can go, but even if the GTX 690 was unable to quite catch the GTX 680 SLI at standard settings the combination of a higher power target and a core clock offset should be more than enough to make sure it can be overclocked to GTX 680 specs. On paper at least some further overclocking should even be possible, as standard power target for GTX 680 is 170W; so 2x170W for GTX 680 SLI means that all else held equal, there’s still at least 15W of additional headroom to play with. Speaking of specifications and performance, for those of you are curious about PCIe bridging NVIDIA has finally moved away from NF200 in favor of a 3rd party bridge chip. With the GTX 590 and earlier dual-GPU cards NVIDIA used their NF200 bridge, which was a PCIe 2.0 capable bridge chip designed by NVIDIA’s chipset group. However as NVIDIA no longer has a chipset group they also no longer have a group to design such chips, and with NF200 now outdated in the face of PCIe 3.0, NVIDIA has turned to PLX to provide a PCI 3.0 bridge chip. As for the card’s construction, while we don’t have the complete specifications on hand we know that the basic design of the GTX 690 is very similar to the GTX 590. This means it will have a single axial fan sitting at the center of the card, with a GPU and its RAM at either side. Heat from one GPU goes out the rear of the card, while the heat from the other GPU goes out the front. Heat transfer will once again be provided by a pair of nickel tipped aluminum heatsinks attached to vapor chambers, which also marks the first time we’ve seen a vapor chamber used with a 600 series card. NVIDIA tells us that they’ve done some further work here to minimize noise by tweaking their fan ducting to reduce obstructions – primarily by eliminating variations in baseplate height that had previously been necessary to accommodate the GPUs – and are claiming that the GTX 690 should be notably quieter than the GTX 680 SLI. The GTX 590 was already a small bit quieter than the GTX 580 SLI, so given the quieter nature of the GTX 680 SLI this is something we’ll be paying particular attention to. Elsewhere, compared to the GTX 590 the biggest change most buyers will likely notice is that NVIDIA has replaced the shrouding material. NVIDIA has replaced the GTX 590’s plastic shroud with a metal shroud, specifically a mixture of cast aluminum parts and injection molded magnesium parts. Ostensibly the use of metals as opposed to plastic further reduces noise, but along with the polycarbonate windows over the heatsinks I suspect this was largely done to further reinforce its ultra-premium nature and to make the card look more lavish. Meanwhile when it comes to display connectivity NVIDIA is using the same 3x DL-DVI and 1x miniDP port configuration that we saw on the GTX 590. This allows NVIDIA to drive 3 3D Vision monitors over DL-DVI – the first DisplayPort enabled 3D Vision monitors just started shipping – with the tradeoff being reduced external ventilation. Finally, we have the matter of pricing and availability. In typical NVIDIA fashion, NVIDIA has given us the pricing at the last moment. The MSRP on the GTX 690 will be $999, exactly double the price of the GTX 680. Given what we know of the specs of the GTX 690 this doesn’t come as any great surprise, as NVIDIA has little incentive to price it significantly below a pair of GTX 680 cards ($1000) since performance will be within 10%, particularly since AMD’s own dual GPU card has yet to launch. This makes the GTX 690 the most expensive GeForce ever, eclipsing even 2007’s $830 GeForce 8800 Ultra. Availability will also be a significant issue. As it stands NVIDIA cannot keep the GTX 680 in stock in North America, and while the GTX 690 may be a very low volume part it requires 2 binned GPUs, which are going to be even harder to get. We’ll know more on Thursday, but as it stands this will probably be the lowest volume ultra-performance card launch in years. While I have no doubt that NVIDIA can produce these cards in sufficient volume when they have plenty of GPUs, until TSMC’s capacity improves NVIDIA has no chance of meeting the demand for GK104 GPUs, and that bodes very poorly for GTX 690. Consequently while this technically won’t be a paper launch it’s certainly going to feel like one; coupled with the low supply only a couple major retailers will have cards on May 3rd, with wider availability not occurring until May 7th. Wrapping things up, while we have the specs for the GTX 690 this is only beginning to scratch the surface. Specs won't tell you about real world performance; for that you'll have to check back on May 3rd for our complete review. Indeed. The amount of money asked for this card is more than what I was planning on spending overall for a system upgrade. Or the gigahertz ! edition... GHz ! (I guess amd was proud they got their second class up past ... no never mind it was all a marketing scheme dishonest as could be from the word GHz appearing). Perhaps I should phrase my sentiments another way: Why the eff is Nvidia and AMD bothering at all with putting out dual GPU cards that all of five people can afford *and* actually see any benefit from? I somewhat agree with you michaelheath, but you have to remember inflation. Heck a decade + ago people were paying a solid 3 grand for a lousy 386 system, so probably anyone not a teenager or barely above understands fairly well - these are high end devices - not much worse than SSD's of any decent size. Heck the Dell 30"ers were over 2 grand forever and can you imagine 3 of those ? So it's not a low price but it's not outrageous, it's just it would be nice if it was $200 instead of $1,000. It's a persons hobby and many hobbies cost thousands of dollars very easily. That's your silliness, not mine. BM&C about price over and over and over and over, yet it's cheaper than the amd release, shoved prices down for those 79xx's, and yet, silly you, moaning and complaining forever.